He was born 13 December 1952, Roudnice nad Labem 1973 – 1980 Studied in the Department of Graphic Art and Book Illustration under Prof. Albín Brunovský at the Academy of Fine Arts in Bratislava. 1985 – 1990 Taught at the Academy of Fine Arts in Bratislava, and 1994 – 1995 at the Teachers’ in the Department of Promotion and Advertising of Comenius University. He has participated in many solo and joint exhibitions and illustrated more than one hundred books. His works can be found in private collections and galleries in Slovakia and abroad. He has taken part in many international symposia in Komárno, Graz and Moravany nad Váhom, Mojmírovce, Olšany. In 1985 he received the 3rd prize at the International Triennial of Drawing in Nuremberg, as well as other awards. The artist lives in Bratislava. Apart from small-size painting, he is also concerned with drawing, graphic art, spatial objects and application of monumental painting to architecture. His academic studies gave him a feeling for a well constructed composition with clarity and precision in its defined shapes, which he could sensitively emphasise with a firmly drawn line. He also showed an ability to penetrate under the surface of depicted reality with a meditative interpretation of the subject, which was combined with the uncovering of a certain mystery interwoven with the eternal symbols of ancient civilisations. Vojtášek’s specific iconography and his own symbolic language are linked with geometric signs, which often vary with the pictorial space of the composition. Pentagrams, squares and triangles alternate with figural shapes. They amplify the natural contrast between the static and dynamic, the rise and fall of human energy, or the polarity between the material and spiritual worlds. Perfectly drawn depiction of the motif is the important expressive principle for Alexej Vojtášek. Various shades of colour or even a gilded effect come to the fore only as a secondary aspect. In some periods of Vojtášek’s creative development, the brilliance and precision of the drawing became an important part of the content, and not only in his illustrative and graphic works, where it is a natural expressive element, but also in painting. Precisely in painting, qualities of light and colour were added to drawing with the aim of significantly assisting the interpretation of the symbolic transformation of the motif providing the content and deriving from the philosophy of the signs of ancient cultures. In this way, he expresses not only respect for millennia old records and the traces of people and periods, but also for their timeless wealth of meaning. Colour tones and light change the content of the work in a natural way. This dialogue with ancient cultures often fills the paintings with deep meditative and magic symbolism, which is put into transformation of female and male shapes. Such works are mainly inspired by the Kama Sutra. All Vojtášek’s works radiate harmony and balance. The colours are tuned to express the varied states of the internal world of the human being. Alexej Vojtášek always filled his paintings with light full of imaginative ideas, acts, myths and legends, such as those associated with the lost Atlantis, which the artist symbolically transmits to us in some of his paintings. In various compositions, he inclines more to content and its connection with the internal symbol, the art form of which sometimes reaches spiritual abstraction. Therefore, it is natural that the modern resources of communication are linked in Vojtášek’s works with the original meanings of symbols known from the ancient civilisations. The paths of action, knowledge, wisdom and commitment should lead to the perfecting of the person. Alexej Vojtášek has attempted to express this philosophy with a balance of lines, shapes and chosen compositional principles. He let colour and light keep their magical and timeless characteristics. In agreement with Kandinsky, we could say that for Vojtášek they became the means to directly influence the soul. Colour is the keyboard, the eye is the striking hammer, the soul is the piano with many strings. The artist is the hand that causes vibration of the soul by striking it or a different keyboard. Alexej Vojtášek is an artist, who strives to make the soul of the viewer and perceiver of the present age vibrate. Man looks back to see ahead better. To understand and comprehend. Art is a part of such looks. It is a creative game. An expression of peace and restlessness, critics and speculation, which directly leads to formation of values, named as civilization today. 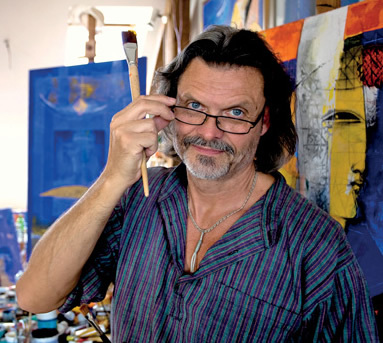 Work of Alexej Vojtášek is an excellent contribution to the Slovak creative expression. It becomes a part of its permanent artistic values because it comes out from proved and demanding requirements for the present art. Mastering of artistic techniques, tight and relaxed hand, sovereign drawing expression, originality and uniqueness. A gift of putting energy and life into a painting. Putting into its structures expression means of a poem. Any time you look at it, it always talks in different language. He began with free graphics and drawing. Specially motivated by greatness of human and his mission on this earth, he displayed his nobleness in sophisticated compositions. In such way he created hundreds of graphics as well as book illustrations and drawings. Thanks to the perceptive view of life and world he laid down a basis for author creative path, which became crucial for his whole future work in ideas and contents. Humanity and challenge. He entered the artistic life during his studies at the Academy of Fine Arts and Design in Bratislava in the 70-ties. Exceptional record of the time, which was not bad. He shined with ideas, exclusive expression and virtuous mastering of techniques. He was a satellite and at the same time a part of the big approach of the generation of 50-ties, which brought new and exceptional values. It was a strong and impressive generation of graphic artists, students of Vincent Hložník or Albín Brunovský and painters under Peter Matejka and Ján Želibský. These artists put a contribution into the art, which is developed even today. They created excellent works. Like in the last rising generation of our artists before 1989, they were hiding something hardly definable. Isolation and system created atmosphere of a characteristic creativity, exactly what is missing in the current art. Their value is indisputable and it is a pity that it only waits to be discovered. They are the artists whose work plays important role in the Slovak art for more than two decades of the capitalist era. Artistic fixed stars. At the end of 20th century, Alexej Vojtášek gradually discloses secrets of colour and shape also in painting. In combined painting of large formats as well as in private sculptures. He creates an authentic series of creative references to the eras, which art has always been admired. Rebirth in the presence. In his paintings pharaoh ships and nowadays are coated in gold. Ships symbolize motion. Crowns symbolize their kings and queens. He brings figures in profile into the artistic expression. The new figuration meets and speaks. Perspective is only suggested, looking for its place. Eye is a circle, which can see. Ionian columns with volutes. Cubist women. Miroo’s stimuli of naiveté. Fish. Stills. Influences of centuries in the final composition. Lexo’s paintings are rich in visual perceptions, monochrome as well as rich colourfulness. Warm red and blue are royal colours. Greenish flamboyance resembles gothic flames rotating in spirals. He prefers geometric composition, often centralized. He applies symbols of eternity, triangle, square and spiral. Op art. In his graphic works he uses networks of lines and lineas. He accentuates them by plasticity and engraving into painting. Figures with atomic circles at their feet. Culture is art and science. Lexo is an artist. These paintings has quickly become magnets for collectors. Not only for their attractiveness. Their author managed to charge them with the often mentioned but undoubted energy of life. With every sight they have a different expression. They radiate challenge and peace. Masterwork that smiles. Maybe it knows it is good. Painting on existence, on state of the world. Our friendship started in the half of 70-ties of 22th century. Times of never-ending searching and conversations. Times of exhibitions and exhibitions again. Writing articles, read bz the whole Slovakia. Galleries were everywhere, in every newspaper editorship. And all newspapers wrote about them. People got educated by all of this. Nobody asked them what they are interested in. Maybe they would not even know. Today, Alexej Vojtášek is a prestigious artist of a European format. The more often man begins, the more meaningful his life is. Also a newly built, transformed reprise is a beginning. As a matter of fact, beginnings are in each new day. Each author’s work is a beginning. Picture in picture. Window into the world. It reveals something unknown. In a peaceful atmosphere it places a number of visual questions. On altars of the future.